Objective: Predictive and prognostic markers have revolutionized personalized therapy in non-small cell lung carcinoma (NSCLC). Crizotinib is now approved for locally advanced or metastatic NSCLC that is anaplastic lymphoma kinase (ALK) positive by either Fluorescence in situ hybridization (FISH) or immunohistochemistry (IHC). The current study aimed to detect the incidence of ALK gene re-arrangement in the Indian population, to compare the various IHC antibodies with FISH as a gold standard, and to analyze the morphology of cases with ALK phenotype. Material and Method: A case series of 614 cases of NSCLC were included. IHC for detection of ALK phenotype was compared with FISH using 5A4 clone (Labvision, USA), ALK-1(Dako, Denmark) and D5F3 clone (Ventana, USA). Results: ALK gene rearrangement was evident in 4.07% of the cases. Cases with ALK phenotype had unique histomorphology with presence of mucin or signet ring cells in association with necrosis, high tumour grade and poor differentiation. Comparison of various antibody clones used in IHC revealed that the sensitivity and specificity using the D5F3 clone (100%, 100%) and 5A4 clone (87.5%, 100%) were similar while the ALK-1 clone had the lowest sensitivity and specificity (50%, 95.5%). Conclusion: The incidence of ALK gene rearrangement in NSCLC in the current Indian study is within the worldwide reported range of 3-5%. This is the first study from the Indian subcontinent to compare various IHC antibodies used for detection of ALK phenotype. IHC using D5F3 clone and 5A4 clone may be considered as a rapid reliable and inexpensive method for detection of ALK gene rearrangement. The discovery of mutations with predictive and prognostic implications have largely altered the treatment protocols for non-small cell lung carcinoma (NSCLC) particularly the adenocarcinoma phenotype. Adjuvant therapy along with targeted therapy plays a major role in this category 1-3. Anaplastic lymphoma kinase (ALK) gene rearrangements were first reported in NSCLC in the year 2007. The novel ALK fusion-echinoderm microtubule associated protein like 4 (EML4-ALK) was discovered as a somatic gene rearrangement that leads to the production of a chimeric protein, which has constitutive ALK kinase activity 4,5. The US Food and Development Association (FDA) has approved the use of ALK inhibitors namely crizotinib for the treatment of cases that harbour these genetic aberrations as first line therapy 1. There are various methods for the detection of this translocation which include fluorescent in situ hybridization (FISH), immunohistochemistry (IHC), reverse transcriptase-polymerase chain reaction (RTPCR) and sequencing 4-6. In view of the predictive and prognostic implications of detection of ALK mutation in clinical practice as companion diagnostics, in which the frequency of mutations in the Indian population along with the comparison of techniques, IHC antibodies used for detection is an essential area of investigation. Hence, the current study was undertaken with the following objectives: 1. To detect the frequency of ALK gene rearrangement in the Indian population, 2. To compare the various IHC antibodies used for detection of ALK protein over-expression with FISH as a gold standard and 3. To analyse the histomorphology of cases that harbour the ALK mutation with the morphology of the mutation negative cases. This was a tertiary care hospital-based case series that included 614 cases of NSCLC. A detailed clinical and radiological assessment was done. Biopsies from both primary and metastatic sites of NSCLC excluding the squamous cell carcinoma subtype were included in the study. A basic panel of IHC to classify tumours as per the 2015 World Health Organization (WHO) criteria, that included cytokeratin7 (CK-7), thyroid transcription factor-1 (TTF- 1), Napsin markers for squamous and neuro-endocrine differentiation was performed as applicable.FISH for ALK gene re-arrangement using the Vysis ALK break apart probe kit (Abbott molecular) was performed on all 150 cases. A control tissue cell lines (positive or negative) was run with every case. The formalin fixed paraffin embedded (FFPE) tissue blocks were used and sections of 34 microns thickness were cut and mounted on chemically coated slide(Biocare, USA). This was followed by slides baking, removal of wax and dehydration. Pre-treatment was done by 1N Sodium thiocynate, followed by protease digestion. The probe was applied, followed by denaturation and hybridization in Thermobrite (hybridizer). This was followed by washing and application of 4,6-dia-amidino- 2-phenylindole (DAPI) for counter staining. The signals were evaluated in the fluorescent microscope using Zeiss axio imager with ISIS software (Metafer).A total of 50 cells were counted in each case, positive results were reported when at least one set of red and green signal borders had a distance of ≥2 diameters or when there is a single red signal without a corresponding green signal in addition to fused (normal) signals (indicating gene fusion by inversion and deletion). A sample is considered negative when < 10% of the tumor cells show evidence of ALK gene rearrangement, distinctly positive when more than 50% cells show the rearrangement, and equivocal if 10-50% cells showed the re-arrangement. IHC using the Ventana anti-ALK (D5F3) clone, 5A4 clone (ALK/p80Ab-l Labvision, USA) and ALK-1 clone (Dako, Denmark) was performed in 614 cases, 150 cases and 25 cases respectively. The FFPE tissue blocks were sectioned at 3-4 μm, using a microtome (Leica, Germany), mounted on tissue bond-coated slides (Biocare, USA). The immunostaining using the D5F3 antibody immunostaining was performed on the benchmark XT system using the Optiview DAB IHC detection kit and Optiview Amplification kit. The pre-diluted Ventana anti-ALK (D5F3) Rabbit monoclonal primary antibody was used along with the Rabbit Monoclonal Negative antibody in every case. A positive control (appendix) was run with all the batches. Cytoplasmic and/or membranous staining was assessed. A sample was positive when there was presence of strong granular cytoplasmic staining in any percentage of tumor cells and negative when cytoplasmic staining was absent. IHC for 5A4 and ALK-1 clones was performed using the standard IHC protocol. The tissue sections were taken on coated slides followed by de-paraffinization, rehydration and blocking peroxidase activity. This was followed by antigen retrieval in Pascal (DAKO Cytomation, California) using sodium citrate buffer (pH-6.0). Sections were incubated for an hour with 5A4 (ALK/P80Ab-l Labvision, USA), and the ALK-1 antibody followed by treatment with polymer-based secondary antibody kit (Dakopatts, Envision kit, Denmark). Bound antibody was visualized using diaminobenzidine. Sections were counter-stained with haematoxylin and mounted. Positive (appendix) and negative (by omitting primary antibody) controls were run with all batches. Cytoplasmic and/or membranous staining was evaluated for both the 5A4 and ALK-1 antibody clones. Semi-quantitative assessment was done estimating the staining intensity and percentage of tumour cells that were positive. The following scores were given: Score 0- No staining, Score 1- Faint staining in >5% of the cells OR any intensity staining in <5% of the cells, Score 2- Moderate staining in >5% of the cells, Score 3- Strong granular staining in >5% of the cells. The samples with a score of 0 and 1 were considered negative while cases with a score of 2 and 3 were considered positive. The histomorphological analysis was done in terms of the pattern of arrangement of the cells that included solid, micropapillary, acinar, lepidic, loose clusters or dispersed cells along with the presence of mucin (intracytoplasmic/extracytoplasmic). The presence or absence of necrosis was assessed and tumours were histologically graded into well, moderately or poorly differentiated lesions. The morphology of the cases with the ALK phenotype was compared with ALK negative cases. The statistical analysis was done using the Statistical Package for the Social Sciences (SPSS) software version 16. The study was based on diagnostic test evaluation wherein the diagnostic efficacy of the various new IHC clones (D5F3, 5A4, ALK-1) was compared with FISH (gold standard) for the detection of ALK gene re-arrangement. The sensitivity, specificity, positive and negative predictive values for all the 3 IHC clones was derived when compared with FISH (Table I). The association between 2 categorical variables was assessed using the Chi square test. A p-value of <0.05 was considered as statistically significant. Click Here to Zoom Table I: The relationship between the new technique (IHC)* and the gold standard technique (FISH) for detection of ALK rearrangement. The age range of the cases varied from 22 years to 86 years with a mean age of 56.81 years, with 224 cases (36.48%) between the age range of 51 to 60 years. The site of the biopsy was from the respiratory tree in 551 (89.7%) cases and metastatic sites in 63 (10.3%) cases. Amongst the metastatic sites, the most common was the lymph nodes (41.27%). The most common clinical finding in the cases was the presence of lung mass with or without the presence of pleural effusion (Table II). IHC for TTF- 1 was performed in 508 cases, of which 319 (62.79%) cases were positive. The metastatic carcinomas were further subcategorized as adenocarcinoma (n=59), poorly differentiated carcinoma/undifferentiated carcinoma (n=3) and adenosquamous carcinoma (n=1). The NSCLC group was further subcategorized as adenocarcinoma (n=510), adenocarcinoma with squamous differentiation (n=23), undifferentiated/poorly differentiated carcinoma (n=17) and adenocarcinoma with neuroendocrine differentiation (n=1). ALK gene re-arrangement using the FISH technique was non-diagnostic or non-interpretable in 11/150 cases (7.33%) (Figure 1A-C). FISH was interpretable in 139/150 cases (92.6%). The ALK gene re-arrangement was positive in 8 cases which was 5.3% of all cases tested and 5.7% of all interpretable/diagnostic cases (Figure 1F,L). The ALK rearrangement was negative in 131 cases (Figure 1R). There was one case (0.67%) of low grade polysomy of the ALK gene in the absence of ALK re-arrangement (Figure 2A-D). Click Here to Zoom Table II: Demographic features and correlation of clinico-pathological characteristics with presence of ALK protein expression in NSCLC. 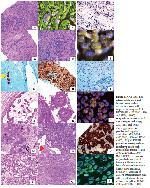 Click Here to Zoom Figure 1: A-C) FISH not interpretable in pleural biopsy diagnosed as adenocarcinoma with negative staining for 5A4 IHC (H&E; x100, IHC; x100 and FISH; x1000). D-I) Adenocarcinoma with signet ring morphology, ALK FISH and D5F3 staining positive with positive and negative control for ALK (H&E; x100, IHC; x100 and FISH; x1000). J-L) ALK FISH positive in micropapillary, papillary pattern with extracellular mucin (H&E; x100 and FISH; x1000). M-O) D5F3 IHC positive in poorly differentiated tumour with solid nests, loose clusters and necrosis (H&E; x100 and IHC; x100). P-R) Absence of ALK re-arrangement in well differentiated morphology with acinar pattern (H&E; x100 and FISH; x1000). Click Here to Zoom Figure 2: Low grade polysomy in absence of ALK re-arrangement. A) Brain parenchyma (Black arrow) infiltrated by a tumour with cells in sheets and focal acinar pattern (H&E; x100). B) Napsin: Positive (IHC; x100). C) TTF-1: Positive (IHC; x100). D) FISH: Polysomy of ALK gene- 25-30% of the nuclei had ≥ 4 ALK gene copies [arrows] indicative of Low Grade Polysomy with absence of re-arrangement (FISH; x1000). IHC using the D5F3 cone was performed in 614 cases. ALK protein over expression was detected in 25 cases (4.07%) (Figure 1G-I). IHC using the 5A4 clone was performed in 150 cases that included 8 cases that were positive for ALK phenotype and 142 cases that were negative. ALK protein over-expression was detected in 7 cases while 1 case that was positive for ALK phenotype using the D5F3 clone was negative using the 5A4 clone. The cases negative for ALK phenotype using the D5F3 clone showed similar results with the 5A4 clone. IHC using the ALK-1 clone was performed in 25 cases that included 2 cases that were positive for the ALK phenotype and 23 cases that were negative for the ALK phenotype. The sensitivity, specificity, positive and negative predictive value for the D5F3 clone was 100%, for the 5A4 clone the sensitivity was 87.5%, specificity and positive predictive value was 100% while the negative predictive value was 99.24%. The ALK-1 clone had a sensitivity and positive predictive value of 50% while the specificity and negative predictive value was 95.5% (the sample size is n=25 for the ALK-1 clone) (Figure 3A-I) (Table III). Click Here to Zoom Figure 3: Comparison of D5F3, 5A4 and ALK-1 IHC clones. A-C) IHC for ALK using D5F3 clone (A), 5A4 clone (B) and ALK-1 clone (C): Positive (IHC; x100). D-F) IHC for ALK protein using D5F3 clone (D) and 5A4 clone (E): Negative, F: IHC using the ALK-1 clone: Positive (IHC; x100). G-I) IHC for ALK using the D5F3 clone (G) and 5A4 clone (H): Positive, I: IHC for ALK using the ALK-1 clone: Negative (IHC; x100). The histomorphological features of the ALK positive (n=25) and the ALK negative (n=183) was analysed. Most of the cases had a mixed pattern on histomorphological analysis. The ALK positive cases had solid pattern and loose clusters or dispersed cells in 64% of the cases, while mucin was present in 36% of the cases. In the ALK negative group 86.89% of the cases had loose clusters or dispersed cells followed by an acinar pattern in 50.81% of the cases. The presence of mucin (p=0.0006) in the ALK positive cases was statistically significant when compared with the ALK negative cases. Necrosis was identified in 64% of the ALK positive cases which was significant (p=0.044) when compared to the ALK negative group. In the ALK positive group, 56% of the tumours were poorly differentiated with a nuclear grade 3 which was statistically significant (p=0.003) when compared with the ALK negative group (Figure 1D,E,J,K,M,N,P,Q). The current study has been carried out in a large case series of NSCLC where ALK mutation was analysed. In view of the current recommendations of International Association for the Study of Lung Cancer (IASLC), that emphasize on the use of companion diagnostics for the detection of ALK mutation in clinical practise and the presence of various IHC antibodies being marketed for the detection of this mutation; it is of importance to analyse the efficacy of these techniques. The ALK gene rearrangement is found in 3-5% of the cases of NSCLC. In the East Asian population, an incidence up to 13% has been reported 4. In the present study this re-arrangement was detected in 4.07% of all cases tested. (Table IV). This is the single largest study conducted for detection of frequency of ALK gene rearrangement from the Indian sub-continent. In this study, cases with the ALK gene re-arrangement had a mean age of 50.08 years which is in concordance to the study conducted by Bal et al. in which the mean age of the ALK positive group was 51.7 years and contradictory to the published reports of Desai et al. and Doval et al. ALK translocations are more common in females. In this study, the male to female ratio in the ALK positive group was 1.5: 1. This is contradictory to the results of Bal et al., Desai et al. and Doval et al. who have reported a higher incidence of ALK gene re-arrangement among females. ALK re-arrangement is more common among non-smokers. In this study 66.67% of the cases with ALK translocation were non-smokers, which is in concordance to the reports published by Bal et al. and Doval et al.4,7-9. In the study conducted by Desai et al. ALK re-arrangement was detected in a higher proportion in the metastatic sites as compared to the primary site 4. This finding was contradictory to this study where detection of ALK re-arrangement at primary tumor site was statically significant (p=0.003). This finding may indicate ALK gene re-arrangement is heterogeneous and this phenotype is lost as tumor disseminates. TTF-1 was positive in 22 cases that harbored this re-arrangement (p=0.003) which was concordant with the results obtained from the study conducted by Inamura et al. 10. TTF-1 plays a role as the master regulatory factor in lung development and in the maintenance of functions of the terminal respiratory unit (TRU). The positivity of TTF-1 in majority of ALK positive cases might suggest that the histogenesis of these lesions might be from the TRU 10,11. In this study, the FISH results for ALK gene re-arrangement were non-diagnostic/non-interpretable in 7.33% of the cases. In the study conducted by Desai et al, 28 out of 224 cases were deemed as not interpretable while McLeer-Florin et at found 19 out of 100 cases as non-interpretable 4,12. The most common causes attributable to un-interpretable signals include poor or sub-optimal fixation, presence of excessive tissue collagen and tissue loss. In our study, 8 cases were not interpretable because of excessive collagen leading to auto-fluorescence. In 2 cases there was overdigestion leading to cell lysis and signal loss and the tissue was depleted and lost during FISH technique in one case. It is essential to adequately fix tissues in neutral buffered formalin and the specimens should be processed according to standard tissue processing protocols 13. Tissue loss is also attributed to improper specimen handling. The histopathological samples submitted for routine diagnosis should be used judiciously by the pathologist. The biopsies should be handled by experienced histo-technologist and excessive sectioning should be avoided. 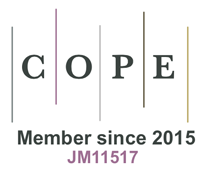 In cases where multiple biopsy cores have been submitted, it is recommended to block each core in a separate cassette to ensure adequate tissue for molecular testing 14. The excessive tissue collagen, commonly found in pleural biopsies produces excessive auto-fluorescence. Hence it is essential to adjust the time of digestion according to the biopsy tissue. It is essential that every laboratory validates the FISH technique and ensures that a control sample is run with every batch to avoid aberrant results. The interpretation and assessment should be performed immediately as storage of stained slides leads to loss of fluorescence and dim signals. The slide should be scanned adequately to assess the distribution of tumour cells, and interpretation should be done in areas with minimal nuclear overlapping and good signal quality 4,13,14. The ALK gene re-arrangement was positive in 8 cases which was 5.3% of all cases tested and 5.7% of all interpretable/ diagnostic cases. In this study, there was one case of low grade polysomy of the ALK gene in the absence of ALK gene re-arrangement. Desai SS et al. and Dai Z et al. stated the polysomy and ALK amplification signifies the genetic differences in tumour tissue. The clinical significance of ALK gene amplification and increased copy number of ALK is not known 4,15. Immunohistochemistry for ALK phenotype detection using the various clones was interpretable in all the cases when compared to FISH that was not interpretable in 11 cases. FISH for ALK gene re-arrangement requires at least 50 viable tumor cells for accurate interpretation of results while IHC can be assessed even when the tumor cell count is less than 50 cells. IHC is easier to perform and interpret and less expensive when compared to FISH 12. The results of FISH and IHC using the D5F3 clone and the 5A4 clone had a strong concordance. IHC for ALK is antibody dependent and the use of the correct antibody clone improves the diagnostic efficacy of IHC 6. In this study the sensitivity and specificity of the ALK-1 clone when compared to FISH was 50% and 95.5% respectively. However, the number of samples tested using the ALK-1 clone is small hence; the diagnostic efficacy of this antibody clone needs further validation for conclusive results. A comparison of the sensitivity and the specificity of the various antibodies clones used for detection of ALK protein with molecular tests showed that the results of the present study are in concordance with the results of similar studies published in literature in the past 3 years (Table V). This is the first study from the Indian sub-continent to compare 3 different clones of IHC used for the detection of ALK protein. IHC using the 5A4 clone and D5F3 clone is a low cost and accurate test for the detection of ALK phenotype. This test is recommended as an alternative to FISH for the detection of ALK gene re-arrangement. ALK IHC can also be performed in a limited resource centre with cost constraints and can be easily done even in the developing and under developed countries 5,6. Comprehensive histological analysis in cases with ALK mutation confirmed that these tumours show histologic features distinct from the wild type cancers. Most of these tumours harbour a mixed morphological pattern 16-28. In this study the most common pattern in the ALK positive tumours was loose clusters or singly dispersed cells and the solid pattern followed by the signet cells morphology with mucin. This finding is in concordance to the results of the study conducted by Yoshida et al. that stated that solid signet ring pattern in 43% of the cases. However, in the study conducted by Inamura et al., the most common pattern was the acinar pattern 10. Necrosis was present in majority of the ALK-positive tumours in this study which is contradictory to the findings of Yoshida et al. 28. Majority of the tumours in the study were moderately to poorly differentiated with a high nuclear grade which is in concordance to the findings of Inamura et al. 10,11. In the study conducted by Li et al, majority of ALK positive tumours had necrosis with high nuclear pleomorphism (29). Among the studies published from India, histomorphological analysis of only the ALK positive cases was done in 2 studies. The most common pattern described by Desai et al. was the solid pattern, followed by the acinar pattern with signet ring cells while Bal et al. stated that the most common pattern was solid followed by a papillary or micro-papillary pattern (4,8). However, none of the studies compared the morphological characteristics of the ALK-positive versus ALK negative cases. Our data on the histomorphologic analysis of the ALK positive tumours state that solid pattern, loose clusters or singly dispersed cells along with presence of mucin or signet cells is characteristic of ALK positive tumours. Most ALK-positive tumours have a high nuclear grade with moderate to poor tumour differentiation and presence of necrosis. The frequency of ALK protein expression was 4.07%. The histomorphology of cases with ALK phenotype is unique with presence of mucin or signet ring cells in association with necrosis, high tumour grade and poor differentiation. This is the only study from the Indian sub-continent to evaluate the sensitivity and specificity of the various IHC clones used for the detection of ALK protein. IHC for ALK using the D5F3 and the 5A4 clone is recommended as an alternative to molecular tests for the detection of ALK phenotype. 1) Salgia R. Mutation testing for directing upfront targeted therapy and post progression combination therapy strategies in lung adenocarcinoma. Expert Rev Mol Diagn. 2016;16:737-49. 2) Dietel M, Bubendorf L, Dingemans AM, Dooms C, Elmberger G, García RC, Kerr KM, Lim E, López-Ríos F, Thunnissen E, Van Schil PE, von Laffert M. Diagnostic procedures for non-smallcell lung cancer (NSCLC): Recommendations of the European Expert Group. Thorax. 2016;71:177-84. 3) Cagle PT, Allen TC. Lung cancer genotype-based therapy and predictive biomarkers: Present and future. Arch Pathol Lab Med. 2012;136:1482-91. 4) Desai SS, Shah AS, Prabhash K Jambhekar NA. A year of anaplastic large cell kinase testing for lung carcinoma: Pathological and technical perspectives. Indian J Cancer. 2013;50:80-6. 6) Conklin CM, Craddock KJ, Have C Laskin J, Couture C, Ionescu DN. Immunohistochemistry is a reliable screening tool for identification of ALK rearrangement in non small cell lung carcinoma and is antibody dependent. J Thoracic Oncol. 2013;8:45-51. 7) Doval D, Prabhash K, Patil S Chaturvedi H, Goswami C, Vaid A, Desai S, Dutt S, Veldore V, Jambhekar N, Mehta A, Hazarika D, Azam S, Gawande S, Gupta S. Clinical and epidemiological study of EGFR mutations and EML4-ALK fusion genes among Indian patients with adenocarcinoma of the lung. Onco Targets Ther. 2015;8:117-23. 8) Bal A, Singh N, Agarwal P, Das A, Behera D.ALK gene rearranged lung adenocarcinomas: Molecular genetics and morphology in cohort of patients from North India. APMIS. 2016;124:832-8. 9) Maturu VN, Singh N, Bal AGupta N, Das A, Behera D. Relationship of epidermal growth factor receptor activating mutations with histologic subtyping according to International Association for the Study of Lung Cancer/American Thoracic Society/European Respiratory Society 2011 adenocarcinoma classification and their impact on overall survival. Lung India. 2016;33:257-66. 10) Inamura K, Takeuchi K, Togashi Y, Hatano S, Ninomiya H, Motoi N Mun MY, Sakao Y, Okumura S, Nakagawa K, Soda M, Choi YL, Mano H, Ishikawa Y. EML4-ALK lung cancers are characterized by rare other mutations, a TTF-1 cell lineage, an acinar histology, and young onset. Mod Pathol. 2009;22:508-15. 11) Inamura K, Takeuchi K, Togashi Y, Nomura K, Ninomiya H, Okui M Satoh Y, Okumura S, Nakagawa K, Soda M, Choi YL, Niki T, Mano H, Ishikawa Y. EML4-ALK fusion is linked to histological characteristics in a subset of lung cancers. J Thorac Oncol. 2008;3:13-7. 12) Mcleer-Florin A, Moro-Sibilot D, Melis A, Salameire D, Lefebvre C, Ceccaldi F, de Fraipont F, Brambilla E, Lantuejoul S. Dual IHC and Fish testing for ALK gene rearrangement in lung adenocarcinomas in a routine practice: A French study. J Thorac Oncol. 2012;7:348-54. 13) Thunnissen E, Bubendorf L, Dietel M, Elmberger G, Kerr K, Lopez-Rios F, Moch H, Olszewski W, Pauwels P, Penault-Llorca F, Rossi G. EML4-ALK testing in non-small cell carcinomas of the lung: A review with recommendations. Virchows Arch. 2012;461:24557. 14) Aisner DL, Marshall CB. Molecular Pathology of Non Small Cell Lung Cancer-A practical guide. Am J Clin Pathol. 2012;138:332-46. 15) Dai Z, Kelly JC, Meloni-Ehrig A, Slovak ML, Boles D, Christacos NC, Bryke CR, Schonberg SA, Otani-Rosa J, Pan Q, Ho AK, Sanders HR, Zhang ZJ, Jones D, Mowrey PN. Incidence and patterns of ALK FISH abnormalities seen in a large unselected series of lung carcinoma. Mol Cytogenet. 2012;5:44. 16) Demidova I, Grinevich V, Avdalian AImyanitov E, Gikalo M, Savelov N, Novikova I, Samuilenkova O, Tiurin V, Ulianova E, Tsimafeyeu I, Tjulandin S. Detection of ALK rearrangements in 4002 Russian patients: The utility of different diagnostic approaches. Lung Cancer. 2017;103:17-23. 17) Mohamad N, Jayalakshmi P, Rhodes A Liam CK, Tan JL, Yousoof S, Rajadurai P. Anaplastic lymphoma kinase (ALK) mutations in patients with adenocarcinoma of the lung.Br J Biomed Sci. 2017;13:1-5. 18) Williams AS, Greer W, Bethune D, Craddock KJ, Craddock KJ, Flowerdew G, Xu Z. ALK+ lung adenocarcinoma in never smokers and long-term ex-smokers: Prevalence and detection by immunohistochemistry and fluorescence in situ hybridization. Virchows Arch. 2016;469:533-40. 19) Incharoen P, Reungwetwattana T, Saowapa S, Kamprerasart K, Pangpunyakulchai D, Arsa L, Jinawath A. ALK-rearranged pulmonary adenocarcinoma in Thai patients: From diagnosis to treatment efficacy. World J Surg Oncol. 2016;14:139. 20) Wang Q, Zhao L, Yang X, Wei S, Zeng Y, Mao C, Lin L, Fu P, Lyu L, Li Z, Xiao H. Antibody 1A4 with routine immunohistochemistry demonstrates high sensitivity for ALK rearrangement screening of Chinese lung adenocarcinoma patients: A single-center largescale study. Lung Cancer. 2016;95:39-43. 21) Jiang L, Yang H, He P Liang W, Zhang J, Li J, Liu Y, He J. Improving Selection Criteria for ALK inhibitor therapy in nonsmall cell lung cancer: A pooled-data analysis on diagnostic operating characteristics of immunohistochemistry. Am J Surg Pathol. 2016;40:697-703. 22) Zhu P, Pan Q, Wang M, Zhong, W, Zhao J. Efficacy of bronchoscopic biopsy for the detection of epidermal growth factor receptor mutations and anaplastic lymphoma kinase gene rearrangement in lung adenocarcinoma. Thorac Cancer. 2015;6:709-14. 23) Shen Q, Wang X, Yu B, Shi S, Liu B, Wang Y, Xia Q, Rao Q, Zhou X. Comparing four different ALK antibodies with manual immunohistochemistry (IHC) to screen for ALK-rearranged non-small cell lung cancer (NSCLC). Lung Cancer. 2015;90: 492-8. 24) Lantuejoul S, Rouquette I, Blons H, Le Stang N, Ilie M, Begueret H, Grégoire V, Hofman P, Gros A, Garcia S, Monhoven N, Devouassoux-Shisheboran M, Mansuet-Lupo A, Thivolet F, Antoine M, Vignaud JM, Penault-Llorca F, Galateau-Sallé F, McLeer-Florin A. French multicentric validation of ALK rearrangement diagnostic in 547 lung adenocarcinomas. Eur Respir J. 2015;46:207-18. 25) Gruber K, Kohlhäufl M, Friedel G, Ott G, Kalla C. A novel, highly sensitive ALK antibody 1A4 facilitates effective screening for ALK rearrangements in lung adenocarcinomas by standard immunohistochemistry. J Thorac Oncol. 2015;10:713-6. 26) Rogers TM, Russell PA, Wright G, Wainer Z, Pang JM, Henricksen LA, Singh S, Stanislaw S, Grille J, Roberts E, Solomon B, Fox SB. Comparison of methods in the detection of ALK and ROS1 rearrangements in lung cancer. J Thorac Oncol. 2015;10:611-8. 27) Pekar-Zlotin M, Hirsch FR, Soussan-Gutman L, Ilouze M, Dvir A, Boyle T, Wynes M, Miller VA, Lipson D, Palmer GA, Ali SM, Dekel S, Brenner R, Bunn PA Jr, Peled N. Fluorescence in situ hybridization, immunohistochemistry, and next-generation sequencing for detection of EML4-ALK rearrangement in lung cancer. Oncologist. 2015;20:316-22. 28) Yoshida A, Tsuta K, Nakamura H, Kohno T, Takahashi F, Asamura H, Sekine I, Fukayama M, Shibata T, Furuta K, Tsuda H. Comprehensive histologic analysis of ALK-rearranged lung carcinomas. Am J Surg Pathol. 2011;35:1226-34. 29) Li G, Hou N, Cao X, Yang Z, Pan S. Expression of anaplastic lymphoma kinase and its clinical significance in non-small cell lung cancer. 2014;43:742-6.